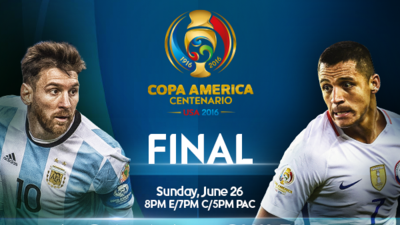 The Copa America Centenario has the final it deserved. This enthralling tournament, full of excitement and incident, will conclude with the two best teams facing each other for the prize. Sunday’s clash between Argentina and Chile is a repeat of last year’s Copa America final which was won by the Chileans on penalties. There is a reason why Argentina, unlike their old rivals Brazil, brought a full-strength squad to this tournament - it is 23 years since they have won a major tournament. Since that 1993 Copa America triumph, the "Albiceleste" have three times been beaten finalists in the tournament and of course they reached the final of the World Cup in 2014 before losing to Germany. Another second-place would be hard to take, especially with a team as talented as the current one. Adding to the pain of those near-misses, the world’s best player, Lionel Messi, who turned 29 on Friday has enjoyed so much success at club level with Barcelona, but remains without a major trophy win with his country. The 2008 Summer Olympics gold medal in Beijing, with a team that also featured Sergio Aguero, Javier Mascherano and Angel Di Maria, remains for the moment just an unfulfilled promise of success to come. Argentina cruised through the group stage winning all three games, including a 2-1 victory over Chile. It didn’t get much tougher in the knockout games - Venezuela were crushed 4-1 while the United States were dismissed 4-0. There has simply been no-one even close to their level. But if there is a team in this competition who have risen to similar heights, it has been the Chileans. They may not have Messi but in midfielder Arturo Vidal and striker Alexis Sanchez they have two of the genuine stars of this tournament. Chile had a tougher path in the knockout stage but they pulled off the shock result of the tournament with their sensational 7-0 hammering of Mexico. with forward Eduardo Vargas scoring four and then they blitzed Colombia with two goals inside 11 minutes before surviving a two hour rain delay and an attempted comeback from the Colombians on a soggy Soldier Field in Chicago. The fans at MetLife stadium in New Jersey should be in for a treat - both teams like to play attacking football at speed and have players who can produce moments of individual brilliance. Yes, many in this country would loved to have seen Mexico or the United States in the final but for the neutral supporter watching on Sunday night, it couldn’t really get much better than this match-up.